Those proclaiming globalization’s demise fall into two camps. Some argue that the process is already underway. 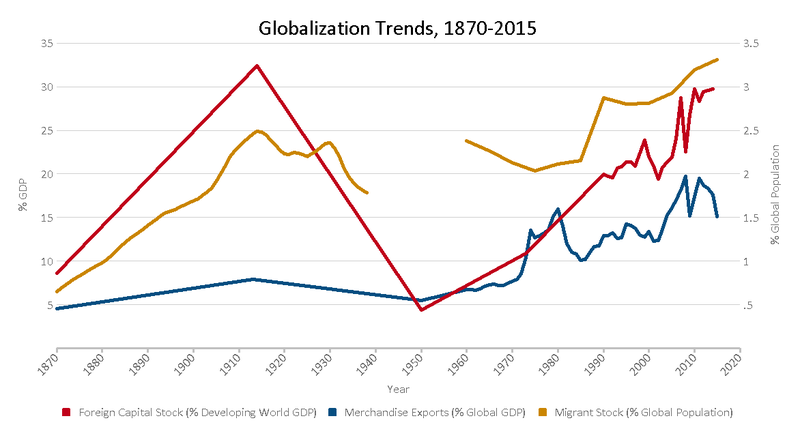 Others argue that globalization has reached unsustainable levels as it did a century ago and so a backlash is inevitable.2 Our three series allow us to verify whether globalization’s retreat has begun or not, and to gauge the degree of today’s global economic integration measured against the peak of the early 20th century. At the end of the first wave of globalization in 1913, merchandise exports peaked at 7.9 percent of global GDP.5 That peak was surpassed as early as 1970, when tariff reductions under the General Agreement on Tariffs and Trade were still at an early stage, the standardization of shipping containers was being established, and the rise of export manufactures from the developing world had yet to occur. Goods exports have since been propelled to far greater heights, reaching 19.7 percent of global income in 2008. Our series for the international movement of money again starts with Maddison. He provides historical estimates of the value of the foreign capital stock in the developing world for a selection of years, based on an assessment of countries’ gross external liabilities.9 Contemporary annual estimates from 1990 onward are built at the country level from independent estimates of external debt, foreign direct investment (FDI), and portfolio equity stocks. These are drawn from a number of independent sources: external debt from the World Bank; FDI from United Nations Conference on Trade and Development; and portfolio equity from the “External Wealth of Nations” dataset developed by Philip Lane and Gian Maria Milesi-Ferretti, and supplemented in the most recent years from the IMF.10 In keeping with the approach for merchandise exports, the series is weighted by developing world GDP, expressed in international dollars. The levels of international capital reported will therefore differ with those cited elsewhere. Four caveats are immediately worth noting. First, the group of countries that constitute the developing world is held constant across the series in accordance with Maddison’s historical estimates.11 Thus, the series does not attempt to control for rising income levels and includes a small number of countries that are today classified as high-income. Sixteen percent of the group’s GDP is accounted for by high-income countries in 2014. Second, the developing world aggregates are assembled independently for each type of capital based on the available country coverage of each dataset. 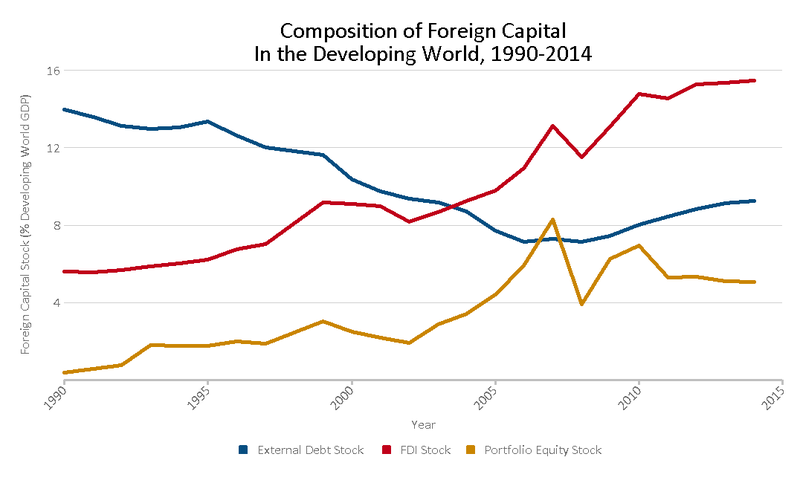 Of the three types of capital, external debt suffers the most from incomplete coverage.12 Third, estimates of FDI and portfolio stocks do not accurately capture the divergent performance—and value—of these assets over time.13 Fourth, we exclude both remittances and foreign assistance in the form of grants—both important sources of foreign capital for the poorest economies—from our measure to ensure consistency with Maddison’s historical estimates. Concerns about the de-globalization of foreign capital since the Great Recession have centered on a different phenomenon: the reduction in inter-bank lending.16 Its causes are believed to include regulatory changes, weakened bank balance sheets, and reduced access to wholesale funding. The fall has been largely limited to banks in advanced economies and so is not captured by our series. While this is certainly an example of international capital becoming less prominent, it should not overshadow the increasing role of foreign capital in other parts of the world. Much commentary on global migration reinforces the notion that migration is growing unsustainably, driven by formidable emigration pressure from source countries, and that anti-migrant rhetoric will soon lead to anti-migrant policies.21 While our series shows that the share of the global population accounted for by migrants is at an all-time high, it does not corroborate this broader narrative. Of course, the likelihood of a clampdown on migration depends on perceptions of migratory trends—especially those at a national level—not their reality. If recent history is any guide, however, governments are more likely to strengthen their selectivity of migrants than impose absolute restrictions. Over the past 25 years, migration policies have become more discerning of migrants’ skills, class, and nationality while simultaneously allowing for a greater volume of migrants overall.25 If the political backlash against migration ultimately focuses on restricting small but highly visible flows, then we should not expect global migration as a whole to decline. Country coverage from the WTO dataset accounts for 99.7 percent of global GDP in 2015. For countries where a very small number of years are missing data, data points are filled in through interpolation or extrapolation. New countries are included from the year in which they achieved independence. Historical GDP estimates, published by Maddison, are expressed in international dollars based on the 1990 ICP. Contemporary GDP estimates, published by the World Bank, are expressed in international dollars based on the 2011 ICP. Our confidence in the comparability of the two series is boosted by the fact that the two sources generate very similar estimates of global GDP for 1990: $27.1 trillion using Maddison’s series and $27.6 trillion using the World Bank series (both expressed in current prices). An advantage of using Maddison’s historical trade estimates, among several alternative sources available, is it means we rely on a common data source for trade and GDP. It is possible that this share was greater in 1929 when the value of global trade was 35 percent above that in 1913 (Federico and Tena-Junguito 2016). But, without an estimate of global income, we are unable to verify this. For the same reason, the extent of the subsequent withdrawal from global trade in the early 1930s is not captured by our series. See, for instance, Hoekman 2015. 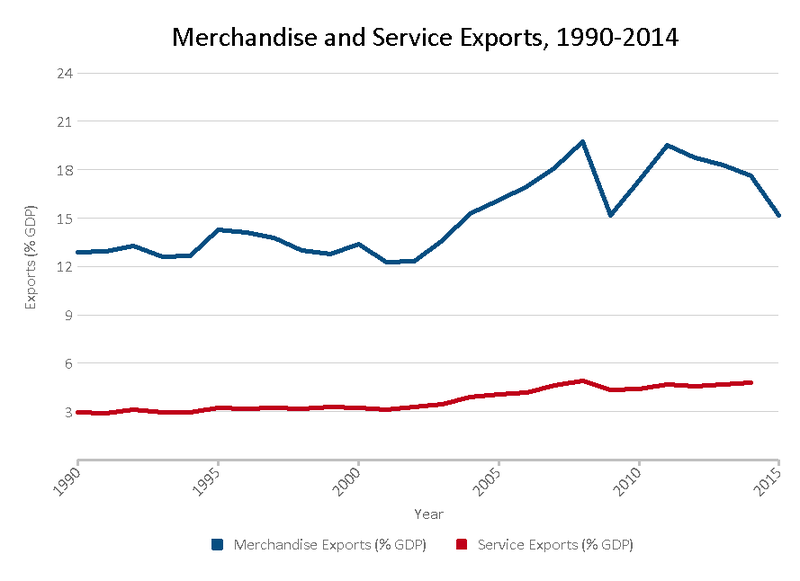 The share of trade in services in GDP is considerably larger (both in absolute terms and relative to trade in goods) when measured in value added terms, since services are increasingly embodied in the production of traded goods. See discussion in Subramanian and Kessler 2013. Data coverage for service exports is especially limited for earlier years. The global service exports data presented in Figure 2 incorporate countries from the first year their data becomes available. These estimates are therefore not concerned with external assets such as outward investments and foreign currency reserves. The External Wealth of Nations dataset on portfolio equity stocks ends in 2011. Estimates of net portfolio equity flows are available from 2012 onward from the IMF’s Balance of Payments Statistics. To estimate portfolio equity stocks after 2011, subsequent years’ data flows are added onto 2012 stock levels, after discounting stocks by an estimated rate of depreciation. This depreciation rate is imputed from a comparison of stocks and flows data between 2000 and 2010. For countries that are missing from the IMF statistics, the portfolio equity stock as a share of GDP is assumed to remain unchanged after 2011. The group consists of all countries in Africa, Latin America, and Asia, excluding Japan. 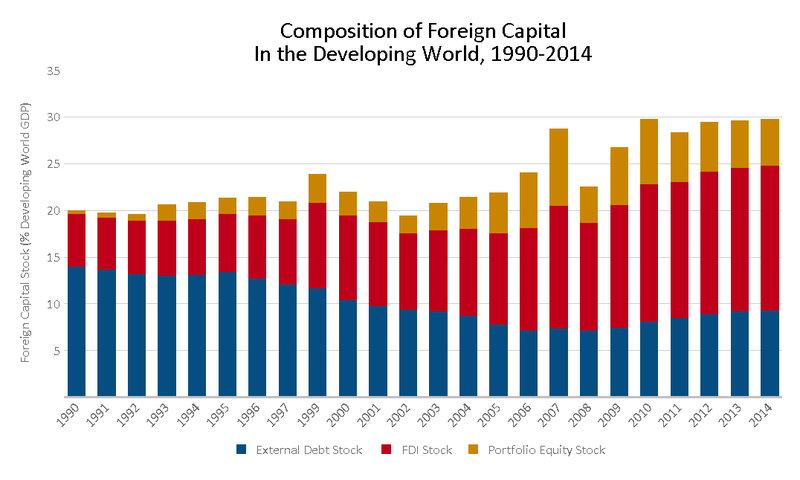 The developing world aggregates for each type of capital are assembled from all countries that have complete estimates between 1990 and 2014. For countries where a very small number of years are missing data, data points are filled in through interpolation or extrapolation. Countries for which external debt estimates are missing account for 19 percent of developing world GDP in 2014. In the case of portfolio stocks, Lane and Milesi-Ferretti assume that their value grows and declines in line with the domestic stock market. There is no consistent approach for capturing changes in the value of FDI stock in UNCTAD’s estimates. See discussion in Fujita 2009. The unmeasured divergence in asset value, known as dark matter, accounts for the inability to reconcile stock and flow data in current account statistics, and, in part, the existence of persistent global imbalances. See Hausmann and Sturzenegger 2007. One important difference today is the role of capital from other developing countries, which our measure captures. See discussion in IMF 2016 which reports a lower inflow of capital into emerging economies in the post-crisis period. Global life expectancy at birth estimates are obtained from Riley 2009. 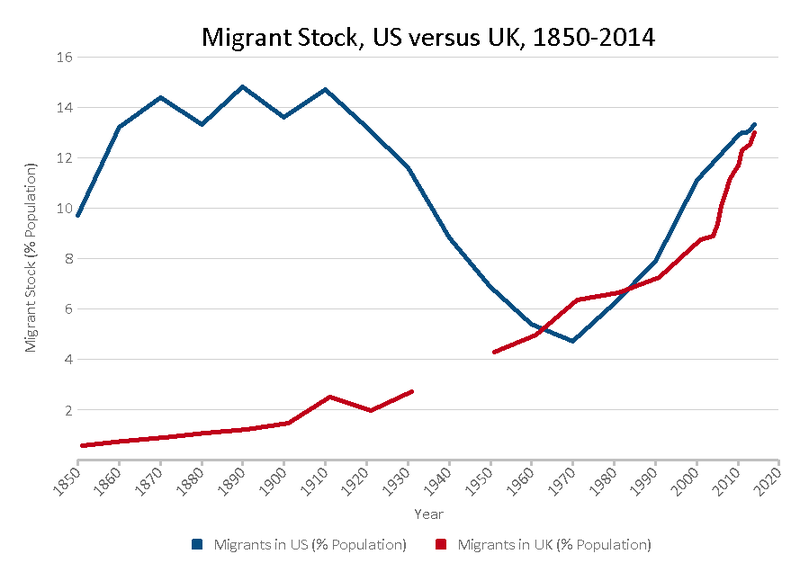 Return rates are published in McKeown 2010 and applied to migratory flows in McKeown 2004.The return rate for European migrants to the US is applied to all transatlantic migration. The return rate for Chinese and Indian migrants is applied to their respective countries. A weighted average of the return rate for all three groups is applied to North Asian migration. The returnees counted in return rates are believed to include both migrants and their offspring born in the destination country. We assume migrants have children at a rate consistent with global population growth in this period. See U.N .2009. The fact that migrants make up a greater share of the global population today than they have in the past does not immediately imply that a greater share of people are now migrating per year. Global life expectancy is dramatically higher than a century ago which means that the ratio of migrant stocks to flows is likely much larger. Czaika and de Haas 2015. See, for instance, Skidelsky 2016. Abel and Sander 2014. Preliminary modeled estimates indicate that the number of global migrant flows dropped by 20 percent between 2005-10 and 2010-15. See Abel 2016.
de Haas, Natter and Vezzoli 2016.